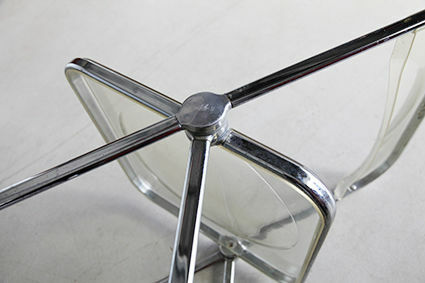 Design period: 1960 to 1969 - Country of manufacture: Italy - Character condition: very good - Style: vintage, mid-century - Materials: metal, plastic colour - Clear width: 46 cm - Depth: 43 cm - Height: 76 cm. For the true vintage lover. 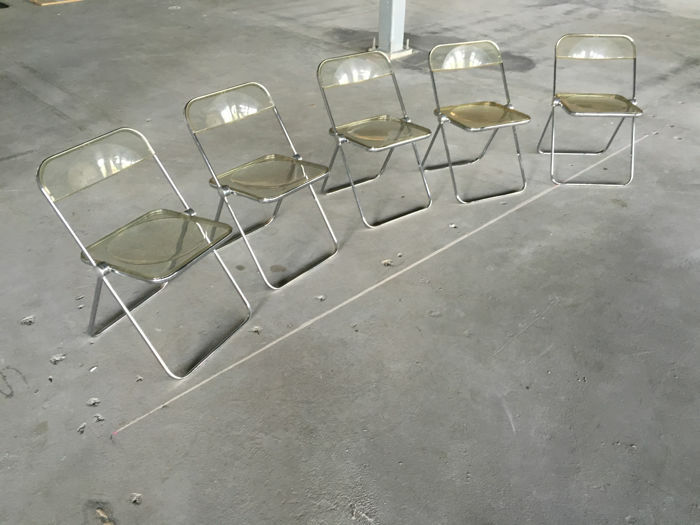 A set of 5 vintage Plia folding chairs by the designer Giancaro Piretti, 1969, Italy. 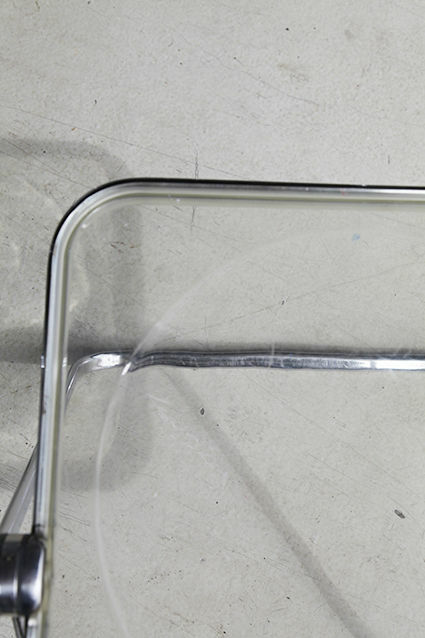 Seat and back are made of plexiglas. These folding chairs are in good condition. They are from the 70s and are original. 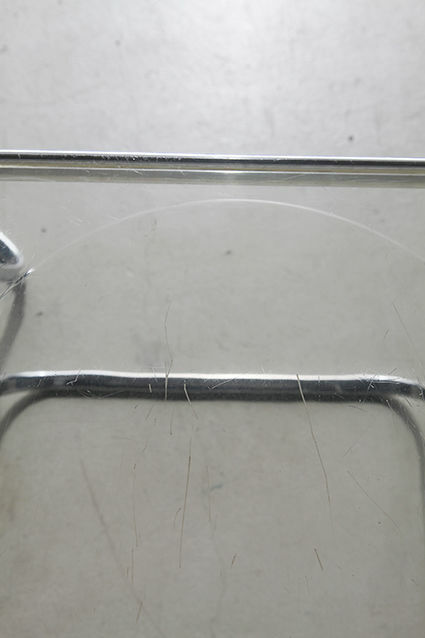 Small scratches are inevitable in plexiglas materials. 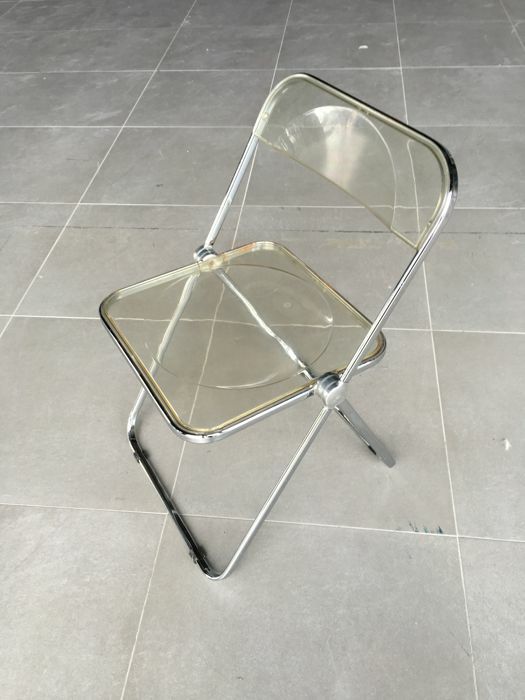 The Plia folding chair was designed by Giancarlo Piretti for the manufacturer Castelli. 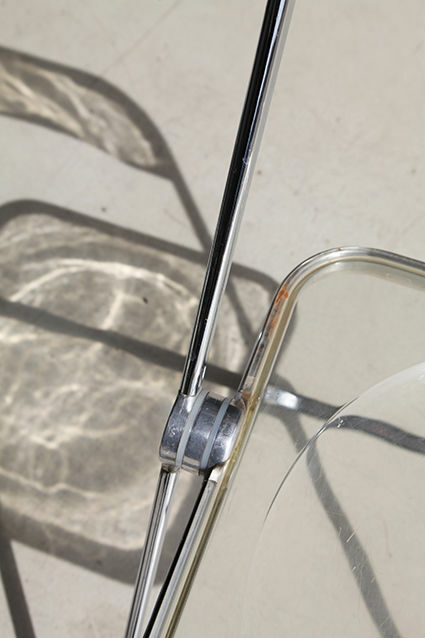 This elegant folding chair is completely transparent and so makes a positively surprising impression. Besides, this makes that the model is easily combinable with the rest of the furnishing. This design is especially well expressed in a modern interior. The chair is designed in such a way that the seat surface has a slight curvature, providing for exceptional comfort. 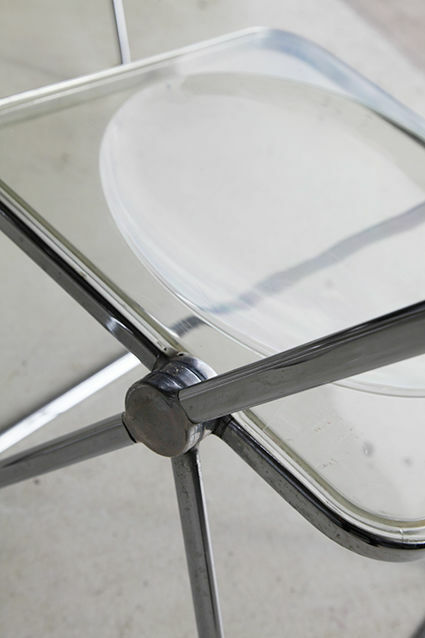 The construction of this chair is made of steel, giving the design a durable character. The Plia folding chair is furthermore made of plastic, making it highly suitable to be placed outside. The design has a width of 47 cm, a height of 75 cm and a depth of 50 cm. The seat height is 43 cm. The chair can be stored in a highly efficient way, and needs little storage room in folded form. Giancarlo Piretti was born in 1940 in Bologna, and completed his studies at the city's highly acclaimed art institute. He was awarded with many prestigious prizes for his famed Piretti Collection in Chicago, including the UBD and the ASID. 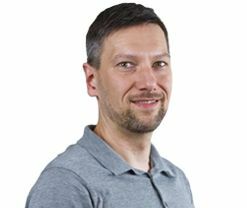 He is currently working back in Bologna, together with his son. Iconic crowned 1967 design by Giancarlo Piretti for Castelli (Italy). 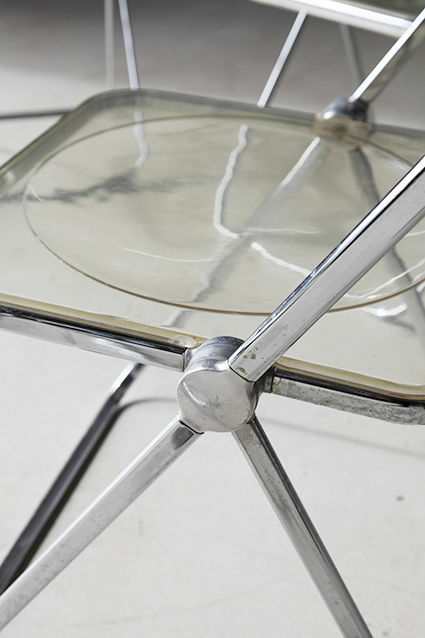 The production of the Plia chair was launched in 1968. 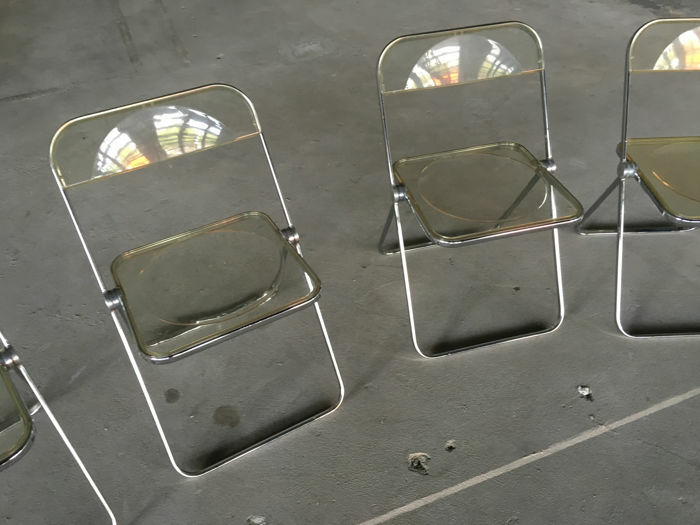 This set of chairs is from the 1970s. 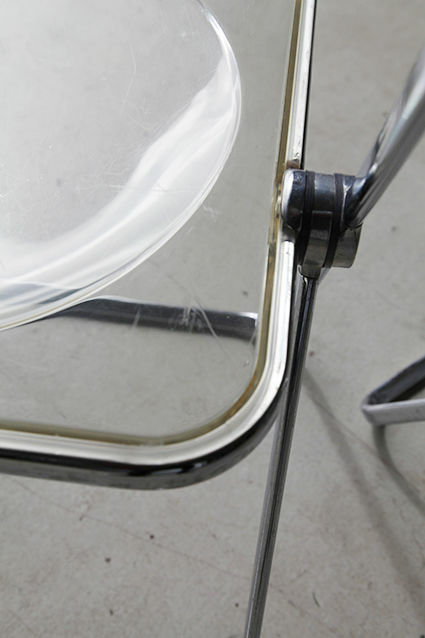 The chair has clear rounded shapes, a steel tubular frame and transparent plastic surfaces. When the chairs are folded, they can be easily stacked together, straight against a wall. Little space in the room is needed for this. Will be shipped by PostNL within the EU and by DHL for destinations outside the EU. Pick-up in Amsterdam is also possible by appointment. På grund av objektets storlek eller ömtålighet, kräver säljaren att det hämtas från Amsterdam (Nederländerna).